Viktor Hamburger died June 12, 2001, one month shy of his 101st birthday. Born in Landeshut, Silesia (then part of Germany; now within Poland), Viktor grew up with a passion for outdoor activities, especially observing and collecting insects and larvae in the fields and ponds near the family home. Following training in Zoology at Breslau, Heidelberg, and Munich, Viktor became a graduate student in the laboratory of Hans Spemann at Freiburg, during the period when the organizer was discovered and concepts of tissue interaction and cell determination were having their initial bloom. Following post-doctorates in Göttingham and Berlin-Dahlem, then an instructorship back at Freiburg, Viktor accepted a Rockefeller Fellowship to study in Frank Lillie's lab at Chicago, bringing the precepts and methods of experimental embryology to a lab in which the chick embryo was atop the pecking order. Due to political changes in his homeland, in 1935 Viktor began a nearly 50-year tenure at Washington University in St. Louis, including 25 years as chairman of the Zoology Department. He also participated for many years in the Embryology Course at the Marine Biological Laboratories in Woods Hole, continuing the fondness for comparative embryology developed earlier. His Manual of Experimental Embryology, first published in 1942, demystified accessing and manipulating early embryos for several generations of students. While embracing the methods of experimental embryology, which combine an analytical approach with the aesthetic appeal of directly engaging the living embryo, it was applications of these methods to problems of the developing nervous system that most captivated Viktor and set the directions he would actively pursue throughout his career. Viktor's early studies on redirected axon outgrowth led him to postulate that trophic factors released by nerves and target tissues are necessary for the proper development of both. His subsequent studies showing that motor neuron survival was dependent upon the amount of target tissue available furthered this belief. During these studies involving chick wing transplantations or extirpations, Viktor discovered that up to 60% of developing motor neurons die in normal embryos. This discovery of programmed cell death, which is a critical component of most developing tissues, has recently emerged as a major focus in biomedical research. Viktor's interests in nerve-target interactions led to, among others, his deep admiration for and friendship with Ross Harrison, whose frequent visits to Freiburg had been a source of much inspiration during Viktor's student days. Shortly after the World War II, Viktor invited Rita Levi-Montalcini to join him at Washington University and investigate what seemed to be substantial differences in trophic effects on embryonic sensory and motor neurons. This collaboration led to the first identification of a developmental growth factor, Nerve Growth Factor, which is essential for the differentiation and survival of many sensory and sympathetic (but not motor) neurons. Viktor certainly appreciated the irony that decades of unsuccessful attempts to isolate the chemical nature of Spemann's Organizer were eclipsed by this discovery of a neuron-specific trophic factor. Today, hundreds of growth factors acting often in concert are known to modulate cell phenotype in embryonic and adult tissues, and several of Viktor's early NGF collaborators shared in receiving the Nobel Prize in 1986. Viktor, however, turned his attention to functional aspects of neurogenesis, investigating the interactions necessary for the orderly development of embryonic motility and patterns of limb movement. His goal was to dissect those network components that come into play independent of inputs from those requiring functional feedback. He and his colleagues isolated parts of the embryonic nervous system and found that most behavior-generating neuronal networks develop normally. As always it was the chick embryo that served as model system. Indeed, it is because of the stage series of chick development he and Howard Hamilton devised in the early 1950's that Hamburger's name is most widely known among students of vertebrate development. Though best known for his work in experimental embryology and neuroembryology, Viktor's interests and life perspectives were very much a melding of natural sciences with philosophy, literature and the arts. His publication topics range from color changes in fish during their mating season to the geology of Silesia, from mechanistic explanations of human birth defects (in the 1930's) to analyses of the influence of vitalism on early embryologists. The Heritage of Experimental Embryology: Hans Spemann and the Organizer (1988) brings to the current generations a sense of the excitement and uncertainties present during this early period of discovery, illuminating the personalities and conceptual perspectives of key researchers involved. Viktor touched all who knew him by his wisdom, dignity, generosity and kindness. He had little patience for imprecision of thought or language, in science and also other endeavors, but taught always by example rather than criticism. In his presence events seemed more purposeful and disciplined, yet his conversations betrayed a wonderful, often playful sense of humor. Viktor knew and worked with many of the founders of experimental embryology during the first half of the 20th century, but did not dwell upon this past with nostalgia. Rather, he taught that the ideas enabling great accomplishments in science are timeless, and we who practice - or are learning to practice - developmental biology today benefit by understanding not only what our predecessors accomplished but also why and how they did so. 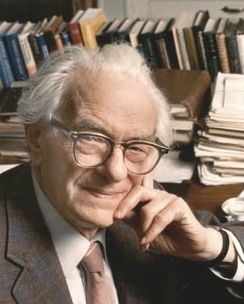 A full description of the life, publications, and many awards of Viktor Hamburger is available through the Washington University Library web site (http://library.wustl.edu/units/biology/vh/). Portrait photo above courtesy of Washington University archives. 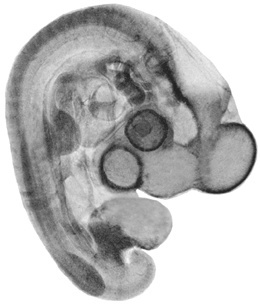 Stage 21 (4-day) chick embryo above from "A series of normal stages in the development of the chick embryo." J. Morph. 88:49-92 (1951).